In September 2014, BBC released a report detailing future low-cost fighters, headlined “The low-cost fighters to serve tomorrow’s air forces.” They mention the JF-17 platform co-designed by China and Pakistan, and briefly touch on the Yak-130, developed by Russian aircraft maker Irkut Corporation. For the rest of the 1,100 word article, it focuses exclusively on the Textron AirLand Scorpion. For starters, the subsonic, twin-engine jet costs $20 million, and operating costs dial in at around $3,000 per flight hour, according to a BBC report by Russell Hotten. For comparison, the efficient A-10 Thunderbolt II, otherwise known as the “Warthog,” costs an initial $19 million and operational costs are estimated at $17,716 per flight hour, though these numbers will vary based on year and modifications. The most expensive weapon in the U.S. military’s arsenal? Say hello to the B-2 Spirit stealth bomber, clocking in at approximately $169,000 per flight hour. These numbers were provided by a report from the Air Force comptroller’s office, obtained by Winslow Wheeler, director of the Straus Military Reform Project. In the report, costs are listed for every airframe in the U.S. Air Force, excluding the F-35 Lightning, manufactured by Lockheed Martin, which is currently undergoing final development and testing. While the Scorpion beats every combat aircraft listed in the report in cost-per-flight-hour, what may prove more impressive is how it was created. “It is a clean-sheet design. No kidding, I was actually the first Textron AirLand employee,” said Bill Anderson, CEO of Textron AirLand and vice president of Military and Government Programs at Cessna. “I went out and hired people who I thought could bring real value to the design and to the team. From that point on, the twin-seat jet began taking on the design the creators had in mind. Evaluating markets around the world, the compact team formed the Scorpion into a platform capable of several roles. The Scorpion has three hardpoints on each wing, and can last for seven hours on station without undergoing in-flight refueling. But the fact the Scorpion was built from the ground up in two years raises eyebrows. By allowing creative thinking and quick decision making, Textron AirLand was able to create a state-of-the-art platform quicker than most major contractors take to decide on a design. Add the fact it was all privately financed and aforementioned eyebrows begin to furrow. Why take such a risk? According to Anderson, the time is ripe for the harvest. While the Scorpion airframe is currently not a competitor in the Air Force’s T-X program (Anderson made very clear they are still closely monitoring new developments in that domain), Anderson pointed out the Scorpion’s high capabilities for maritime patrol. 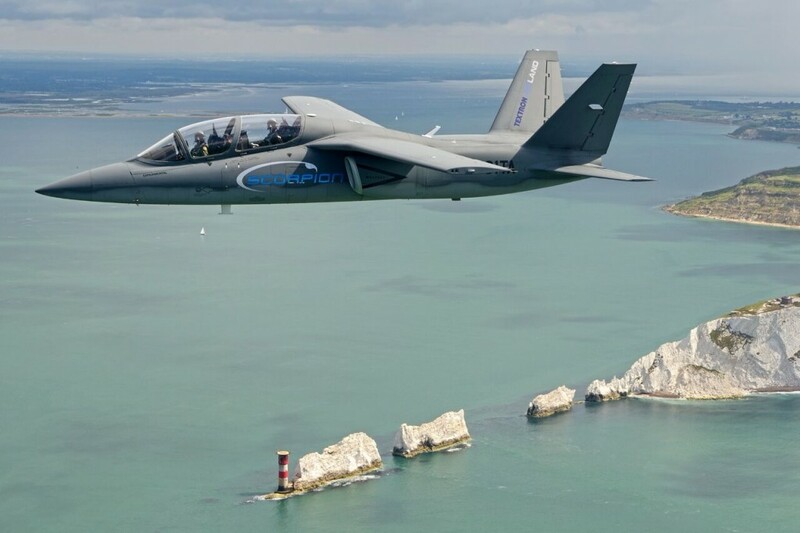 After the Scorpion’s performance at the Royal International Air Tattoo (RIAT) in England, the Royal Navy and Marines in requested the Scorpion to work alongside them for a week of training. According to Anderson, it allowed the program to demonstrate the high-end capability of the Scorpion alongside naval engagements. While current markets appear favorable, Anderson is also looking long-term, analyzing future engagements and how battles are fought and won. Anderson is not alone in this thinking of future warfare. Seth Jones, director of the International Security and Defense Policy Center at the RAND Corporation, offered testimony before the House Committee on Armed Services, Subcommittee on Emerging Threats and Capabilities. In the hearing, he highlighted the fact that non-state actors will force us to think outside the box and change our tactics in defeating an unconventional enemy, whether it be terrorist networks operating out of Syria or drug-trafficking groups like the cartels in Mexico and in the jungles of South America. In battling an enemy who operates within the shadows and tunnels of rough terrain and mountainous expanses, leading scholars have questioned just how effective supersonic, highly advanced jets could be, often incurring high costs of maintenance and unscheduled repairs. In an age of counter-insurgent warfare, reliability of equipment is gold. Anderson claims to have a trove of it. Anderson is referring to the readiness rate of an aircraft, which essentially means how quickly and efficiently the aircraft can respond to testing, training or an actual mission requirement. For comparison, the U.S. Marine Corps has run into a snag concerning aircraft readiness, reporting that 19 percent of its inventory was not available for use, according to a Reuters report in April 2015. An aircraft unavailable, whether due to unscheduled repairs or maintenance, means an acquired target escapes, a hostage waits longer in captivity, or a suspicious vessel eludes authorities. 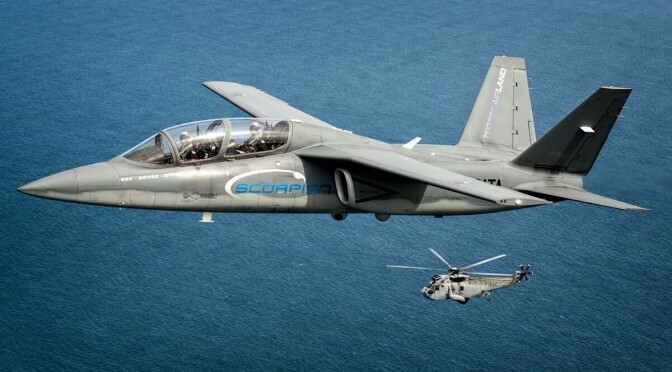 While the Scorpion has proven it has the right stuff, the trickier part will be selling it. One only has to think of the F-20 Tigershark to cringe at the thought of marketing privately financed military aircraft. In its struggled bid for the fighter contract in the 1980s, the F-5 successor lost out to the more expensive, and flashier, F-16 Fighting Falcon. The RAND Corporation called the F-20 program a marketing failure. 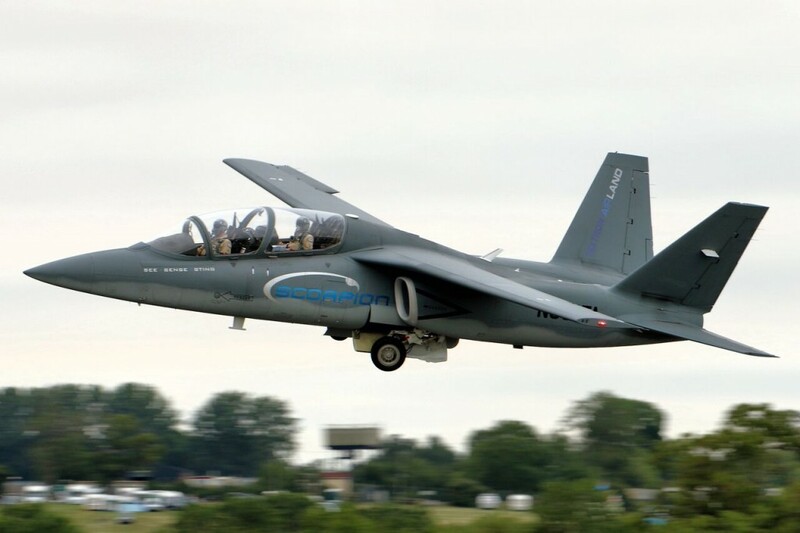 But the team at Textron AirLand has done their homework, and Anderson is confident the interest in the Scorpion will build as time goes on. 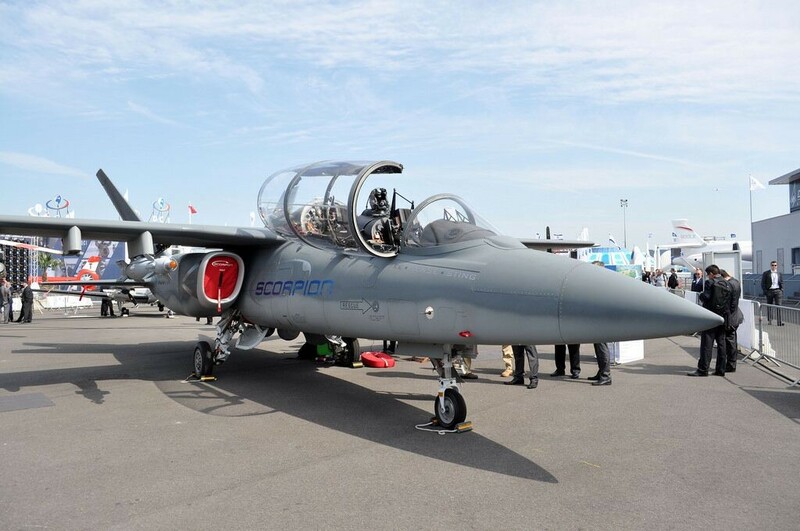 Already, the production-conforming airframe of the Scorpion is being completed, and discussions with serious buyers are ongoing, according to Anderson. “With the long endurance (of the Scorpion) for ISR, it being ideal for maritime patrol, and ability to strike a target all from the same airplane, that’s pretty incredible,” said Anderson. “It’s a unique capability, all at a very, very attractive cost point. David Van Dyk is a graduate of Liberty University with a Bachelor’s of Science in Communications Studies and a member of the Lambda Pi Eta honor society. He is currently pursuing a Master’s in Public Policy with a focus in International Affairs at the Helms School of Government. He can be reached at dvandyk@liberty.edu. Makes good sense to me: affordable/low life cycle cost-high availability-high endurance counter insurgency/multi mission aircraft platform for high-low force mix. Great article.. Mr. Anderson is also genius!